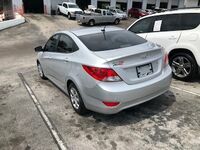 The compact sedan and hatchback segment of the auto industry is incredibly competitive and at the top of the list of best models sits the Hyundai Accent. 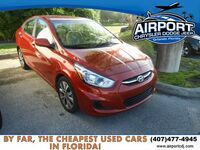 A used Hyundai Accent in Orlando, FL provides you with the technology and comfort you desire and the fuel efficiency you need at a price you can afford. 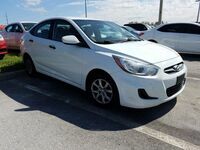 If you’re looking for a used car that is packed full of features, has a great warranty and is extremely fuel-efficient, the Hyundai Accent is a perfect choice. 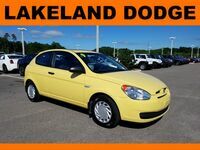 The Hyundai Accent is a small and fuel-efficient compact four-door that is available as a sedan or hatchback. Both the hatchback and sedan can seat up to five passengers and are available in multiple trim levels. 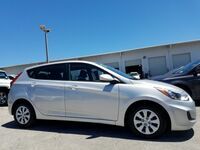 Each trim level of the Hyundai Accent offers a different set of standard features and available options to choose from, so getting exactly what you want in your Hyundai Accent is easy. A spirited and fuel-efficient engine sends power to a front-wheel drive system through your choice of either an automatic or manual transmission. 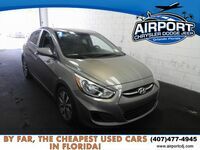 On the inside of a used Hyundai Accent, you’ll find an extensive list of technology features and comfort options to choose from thanks to its multiple trim levels and body styles. 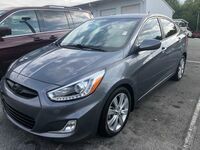 The budget-friendly trim options of a used Hyundai Accent in Orlando, FL give you just what you want in a vehicle and so much more. 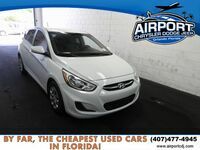 The impressive list of features and options available in a used Hyundai Accent can include items like air-conditioning, keyless entry, power windows and locks, USB ports, satellite radio, a six-speaker audio system, cruise control, Bluetooth® connectivity, steering wheel-mounted controls, leather-trimmed steering wheel, height-adjustable driver’s seat, center console storage with sliding armrest, a tilt-adjustable steering wheel, and many others that will help make every drive more enjoyable.